China and the US have agreed to co-ordinate their response to any "potential provocation" if North Korea goes ahead with a planned rocket launch, the White House says. North Korea says the long-range rocket will carry a satellite. The US says any launch would violate UN resolutions and be a missile test. 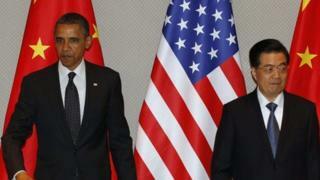 US President Barack Obama and Chinese President Hu Jintao met on the margins of a nuclear summit in South Korea. The launch is scheduled for April. Its timing - between 12 and 16 April - is intended to mark the 100th anniversary of the birth of North Korea's late Great Leader Kim Il-sung. The White House said Mr Hu indicated to Mr Obama that he was taking the North Korean issue very seriously and was registering China's concern with the government in Pyongyang. "We both have an interest in making sure that international norms surrounding non-proliferation, preventing destabilising nuclear weapons, is very important," Mr Obama said ahead of the meeting. But a US national security official cast doubt on any change in Chinese policy, the Associated Press reported. "China has expressed those concerns before and North Korea has continued on with its behaviour," deputy national security adviser Ben Rhodes said, according to AP. "Therefore, China needs to look at whether it needs to be doing more above and beyond the types of messages and warnings it's been giving to the North Koreans." Mr Hu said the North Korean issue was "very complicated and sensitive", the official Xinhua news agency reported. "We do not hope to see a reversal of the hard-won momentum of relaxation of tension on the peninsula," Mr Hu said, according to Xinhua. On Sunday, Mr Obama criticised China for not being tough enough with North Korea, saying Beijing's approach was not working. Earlier, Mr Obama and South Korean President Lee Myung-bak said North Korea risked further sanctions and isolation if it did not cancel its launch plans. South Korea has warned it will shoot down the rocket if it strays over South Korean territory. "We are preparing measures to track the missile's trajectory and shoot it down if it, by any chance, deviates from the planned route and falls into our territory," a defence ministry spokesman said. The launch site is in north-western North Korea, not far from the Chinese border. Last month, Pyongyang agreed to suspend long-range missile tests and uranium enrichment. The agreement was part of a deal for the United States to supply 240,000 tonnes of food aid to North Korea. It also agreed to allow UN inspectors in, the US said. That deal has now been suspended. The overture from Pyongyang came three months after Kim Jong-un came to power in North Korea, following the death of his father, Kim Jong-il. North Korea last carried out a rocket launch three years ago, in April 2009, which it characterised as a test of satellite technology. It said the rocket made it into orbit, though the US and Japan said they had detected no such object. The UN Security Council then passed resolutions prohibiting the North from nuclear and ballistic missile activity. Foreign officials said there were no indications that a satellite had reached space and that the launch was a cover for Pyongyang to test long-range missile technology. Pyongyang responded to the UN resolutions by walking out of nuclear disarmament talks and carrying out a nuclear test weeks later.